Price based on User Role for WooCommerce Pro plugin helps you to set WooCommerce product prices globally or on per product basis. 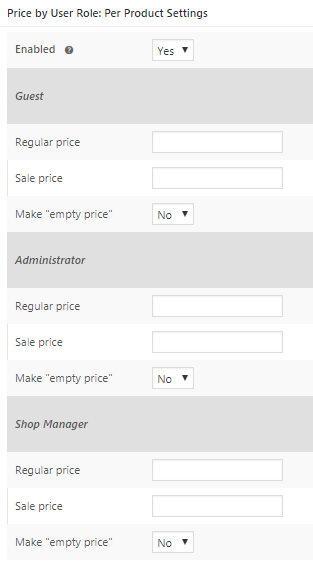 Multipliers settings allows you to set the product prices globally whereas Per Product settings allows you to set prices for each product for different user roles. This section displays options to enable the per product settings and allows you to add roles that you want to display for per product settings. Enable per product settings option is enabled by default and its value is set to Yes. 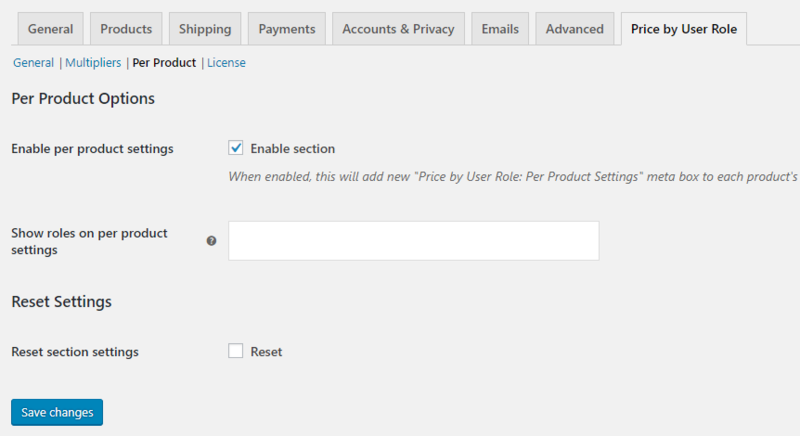 This setting will add a new Price by User Role: Per Product Settings meta box to each Product’s Edit page. By default, the Price by User Role: Per Product Settings option is disabled. To enable it, select Yes from Enabled drop down and click on the Update button on Edit Product page. 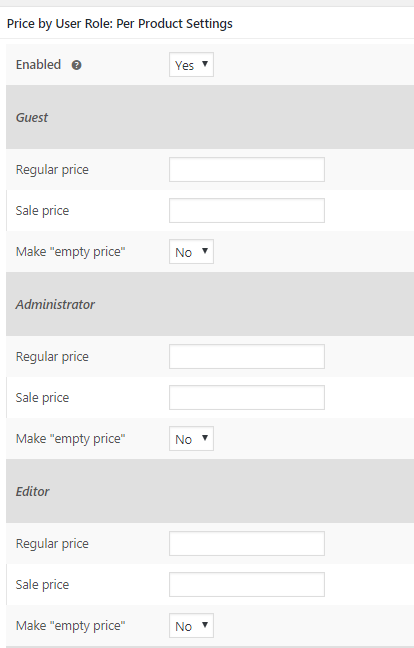 Now you will see that all the different user roles which you have for your online store gets displayed with 3 options each: Regular price, Sale price and Make “empty price”. The above screenshot shows an example where it displays only 3 user roles but this setting will display all user roles on product’s Edit page which are present on your store or under global settings. 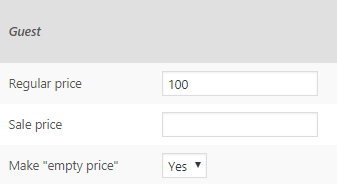 This setting allows you to select the user roles from the drop down, that you want to display under Price by User Role: Per Product Settings meta box. The default value for Show roles on per product settings is None. You can add user roles here to show on each product’s Edit page, only if you enable the per product settings. You can select multiple user roles from the Show roles on per product settings drop down. For instance, say we select Guest, Administrator and Shop Manager roles from the drop down. When you enable the Price by User Role: Per Product Settings, these user roles will appear on all product’s Edit Product page. Remember, only those User roles that you add in the Show roles on per product settings option will appear on Edit Product page. If you want to show all the user roles under Price by User Role: Per Product Settings meta box, then leave this option blank. Here you can add product price for each user role which you want to display on the front end for that product. For instance, say you want to display different price of product Packed Meal for different user roles like Shop Manager and Guest. If you want to give discount to the Shop Manager, you can set a regular price of $75 for that user role and set regular price of $100 for Guest role. So add $75 in the Regular price text box for Shop Manager role. Add $100 in the Regular price text box for Guest role. 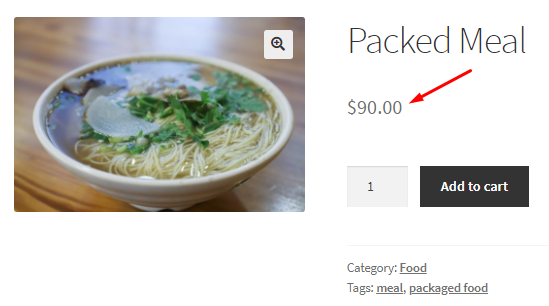 The actual price of the product Packed Meal is set to $90. So on the front end, the price will appear as $90 for all user roles whose regular price is not set in the Price by User Role: Per Product Settings meta box. 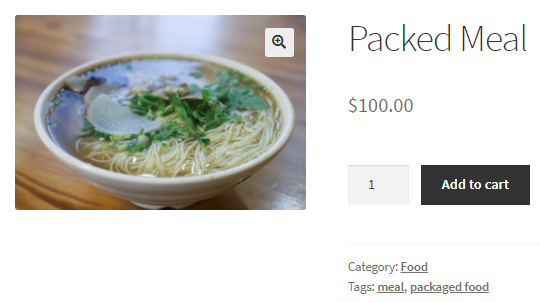 Now when a Guest user visits the store and selects the product Packed Meal, he will see a price of $100 which is set on its Edit Product page for Guest role. Similarly, when a Shop Manager comes to the store, he will see a price of $75 for Packed Meal product. This is because a regular price of $75 is set for Shop Manager role in the back end. 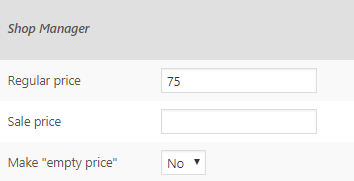 Therefore the prices set for different user roles under Price by User Role: Per Product Settings meta box will always be considered despite of product’s actual price. You can set a Sale price for different user roles in the Price by User Role: Per Product Settings meta box. This will show a Sale tag and display a sale price for that product on the front end. For instance, say you want to provide a discount to your Guest users for product Meal Set. So you can set a Regular price of $80 and a Sale price of $70 for this product under Guest role in the Price by User Role: Per Product Settings meta box. Now when a Guest user visits your store and checks product Meal Set, he will see a Sale tag on the product’s page with a sale price of $70. You need to add both Regular price and Sale price for the user role, for Sale price to be effective on the front end. You can use this option for different user roles to highlight the products which are on sale on your online store. This option allows you to display products with no price for specific user roles. For instance, say you don’t want to display price for the product Packed Meal when Guest users visit your store. So select Yes in the Make ’empty price’ drop down for Guest role on Packed Meal product’s Edit page. Now when a Guest user comes to the store, he will see the product Packed Meal with no price. An Add to cart button will also not appear, restricting him from making a purchase. This way you can restrict any user roles from placing an order on your store. This option allows you to reset the settings under Per Products Options section. The Enable per product settings and Show roles on per product settings will reset to its default settings when you tick the Reset section settings checkbox. This means Enable section checkbox will be ticked. Also Show roles on per product settings will become blank, therefore all user roles will appear on the Edit product’s page under Price by User Role: Per Product Settings meta box. Note – The reset setting will not reset the Regular and Sale price which were set under Price by User Role: Per Product Settings meta box. So if you have prices set for different user roles on Edit Product’s page, those will continue to reflect for those user roles even if you reset the settings on Per Product page.